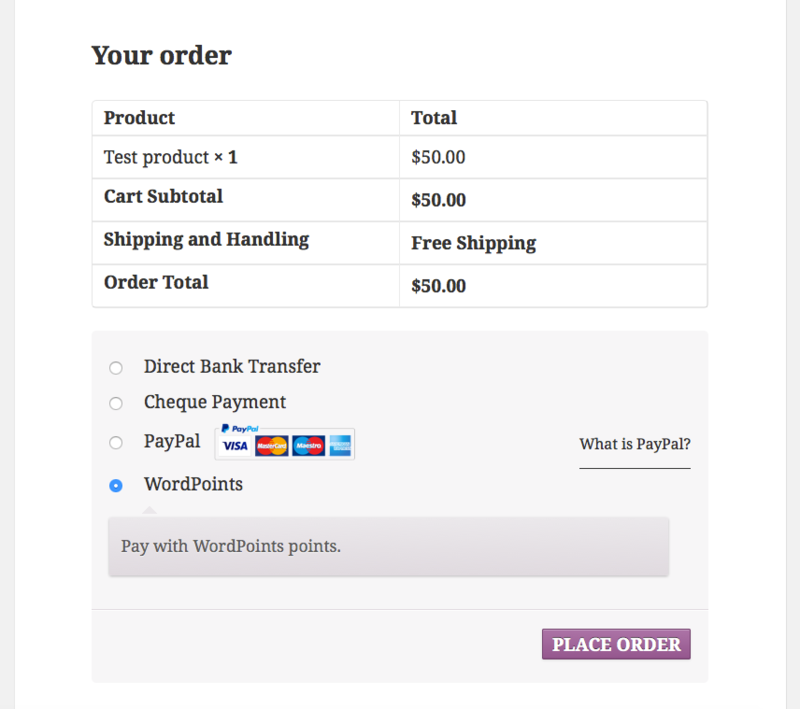 This extension integrates WordPoints with the WooCommerce plugin. 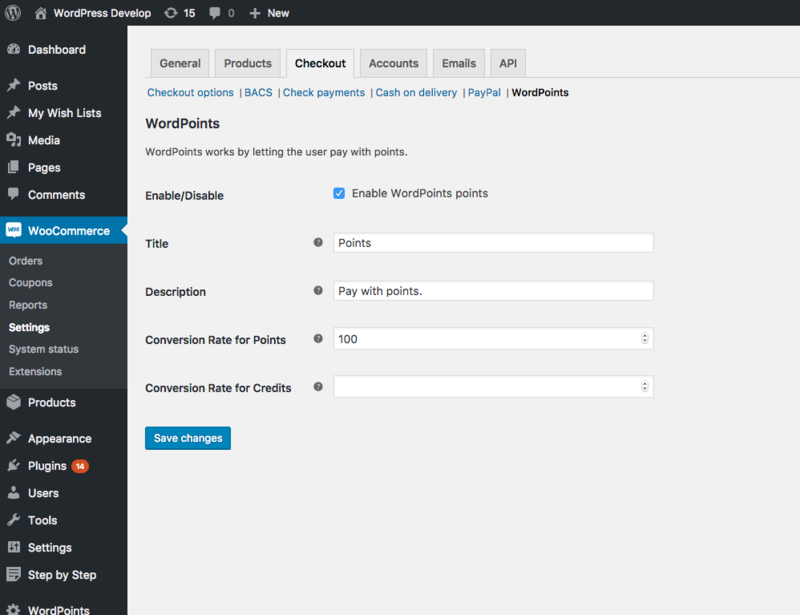 The extension provides a payment gateway that lets your users pay for products with points. The gateway will make sure that users have enough points before letting them pay, and also fully supports refunds. The payments and refunds are logged, as with all points transactions, and the log includes the order number. You can easily configure the gateway to use the points type(s) of your choice, if you are using multiple points types. You can also set how much points are worth. You can, for example, have $1 be equivalent to 1 point, or you can have $1 be worth 100 points, or any other value you choose. The value of each points type can be set independently, so you can have one points type be worth $0.10 and another one be worth $0.05, for example. However, when users are checking out they must choose to pay with one points type or the other; they cannot use multiple different types of points to pay for a single order. Other configuration options include the name and description of the gateway shown to the user when they checkout. 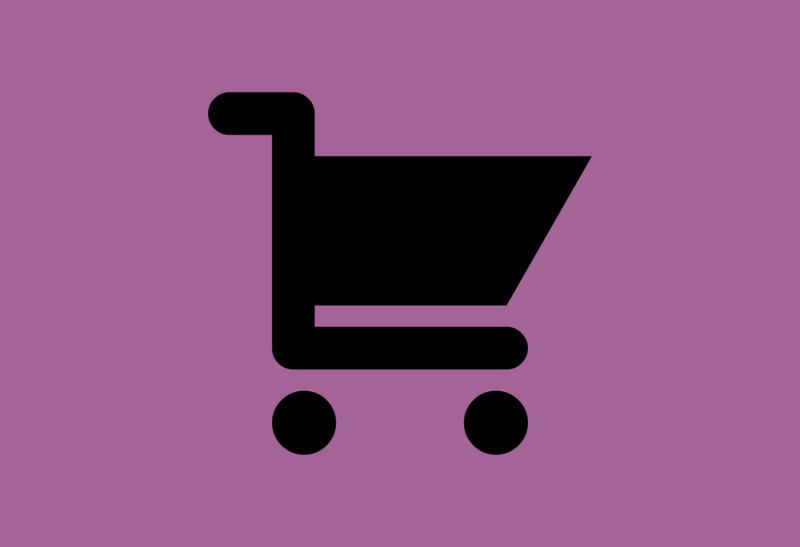 Order Complete — Occurs when an order is marked as completed (and reverses the transaction if the order is fully refunded later). It can be used to award points to the customer. Conditions can be set on the Customer Note, Date Completed, Date Created, Date Paid, Cart Tax, Shipping Tax, Tax Discount, Discount Total, Grand Total, Shipping Total, and “Created Via” order attribute. Publish Product — Occurs when a new product is published. 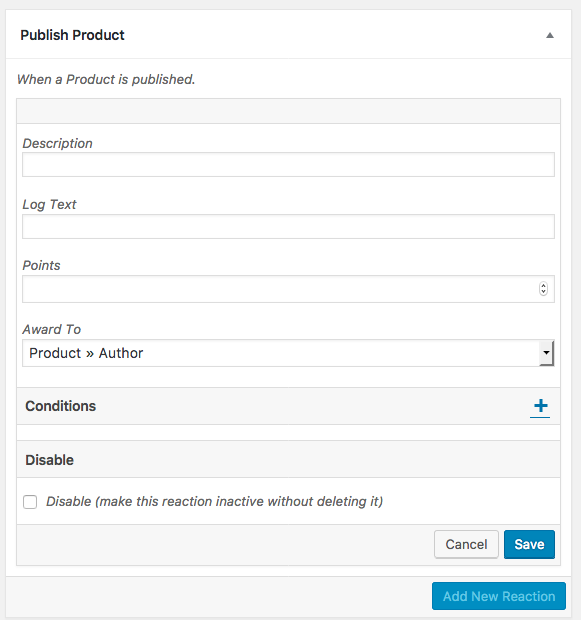 Can be used to award points to the product author. 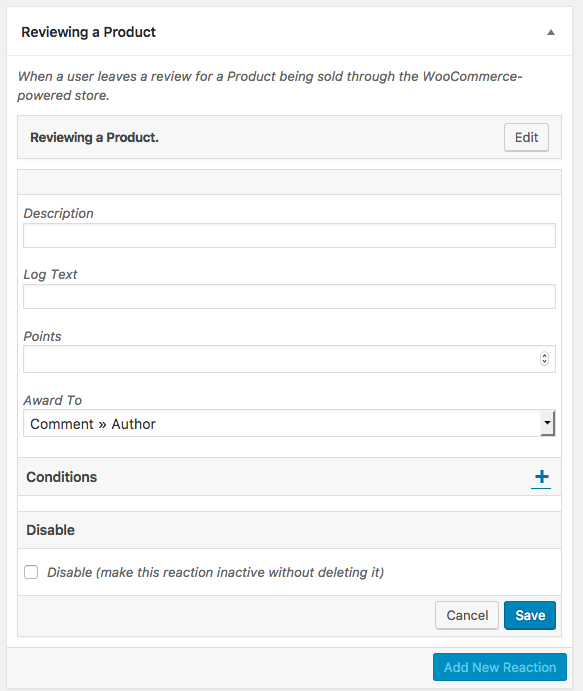 Conditions can be set on the product’s attributes, like Comment Count, Content, Excerpt, and Title. Reviewing a Product — Occurs when a user leaves a review on a product. Can be used to award points to the review author and/or the comment author. Conditions can be set on the review contents, the author’s attributes, and the product’s attributes, like Comment Count, Content, Excerpt, and Title. Tip: The Order Complete event allows you to award a fixed number of points by default (like 20 points per order), but you can also purchase the Dynamic Points extension to award points based on how much the user spent on the order. For example, using the Dynamic Points extension, you could award the user 5 points for every dollar they spend, with a maximum of 100 points. Or any other way that you want the points calculated. 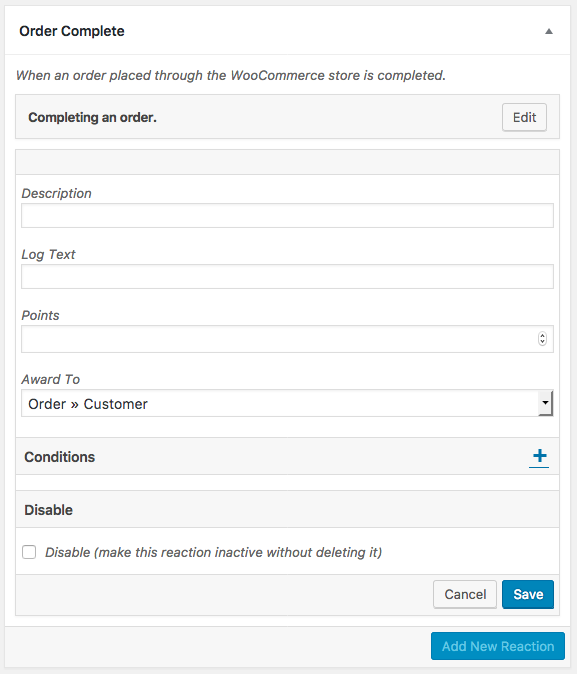 Add both the Dynamic Points and WooCommerce extensions to your cart and get 20% off the bundle with the coupon code WCDYNAMIC! Paying for an order through the points gateway. The settings for the points gateway. The points logs for an order and a partial refund. Reviewing a Product event settings.